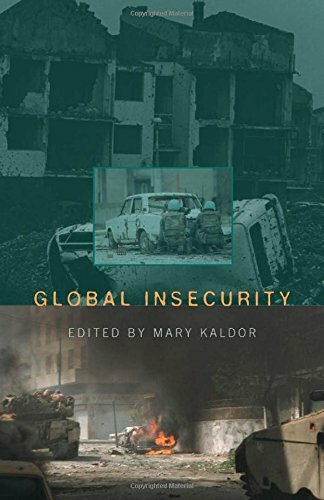 Mary Kaldor is Professor and Director of the Centre for the Study of Global Governance, London School of Economics and Political Science. She was a founder member of European Nuclear Disarmament (END), founder and co-chair of the Helsinki Citizens' Assembly, and a member of the International Independent Commission to investigate the Kosovo Crisis. Tell me about the Clausewitz book. Well, this is the sort of Bible of military strategists. Clausewitz was a Prussian soldier who fought in the Napoleonic wars (1799-1815) and this had a transformative effect on him. He got a job at the defence academy and wanted to write a theory of war but he never actually finished it. He died in 1831 not having finished On War, but his widow put it together for him. It has had an enormous impact and really is the Bible of war. His theory of war is that it is the essence of war to go to the very extremes. War is an act of violence designed to force our will on our opponent. It is only if you put absolutely everything into this effort that you can win. Absolute war is an ideal concept and it is different from real war. In real war, the tendency to fight to extremes is moderated by politics or by what he called “friction” – weather, logistics, accident, etc. Clausewitz argued that Napoleon had demonstrated that absolute war could be a reality. He describes war as involving “the trinity” – you have reason (the government), chance and strategy (the generals) and passion and emotion (the people). Napoleon married passion to reason, thereby mobilising the people, and so war reached its absolute point. Clausewitz said that war was the instrument of politics, like a language, but rather than writing notes you fight battles. The question is – are we still Clausewitzian? No. But military people love him and say that you can be Clausewitzian even if not all wars are extreme. Other people think we have become post-Clausewitzian and the First and Second World Wars were the most absolute. So, is Clausewitz saying that absolute war is a good thing? That Napoleon was a good thing? Is it a kind of manual? He thought Napoleon was just amazing. There is lots of manual in it. For example, he says there’s an asymmetry in war in that the defence is always stronger than offence. You need more power to attack than to defend because defence can retreat and wear down the offence. But he did think that “the Mighty Sword of Vengeance” would have to be used in the end, that you mustn’t be squeamish. He is often used to justify annihilation. I think his definition of war is wrong. For him war is a contest of wills using violence. I think it is still framed like that but it isn’t always the case. 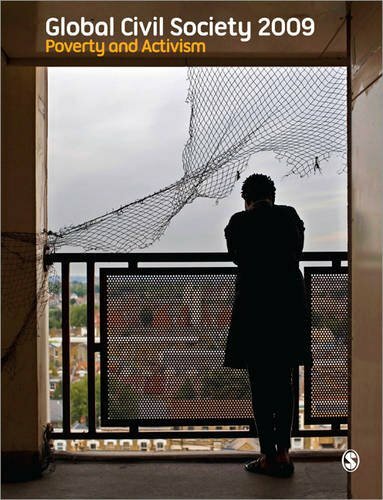 Often the violence of war is legitimised in terms of the conflict when really it is a mutual enterprise. If you look at the Cold War or the War on Terror, both sides need an enemy and are really interested in other things. And if the war is a kind of mutual enterprise it goes on for much longer. In Yugoslavia the Serbs and the Croats basically wanted to carve up territory and in Iraq the Sunnis and the Shias are doing the same, and, rather than fighting battles, they were killing ordinary people. What about the Michael Walzer book? This is another classic. 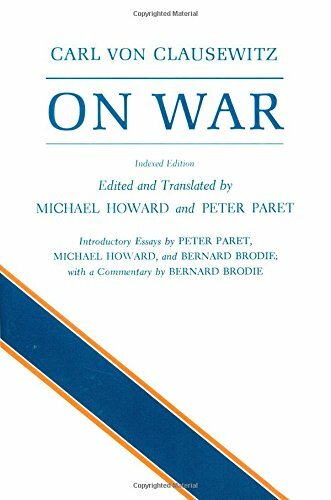 He is a philosopher and he wrote it after the Vietnam war (1959-1975), asking the question – is war ever just? 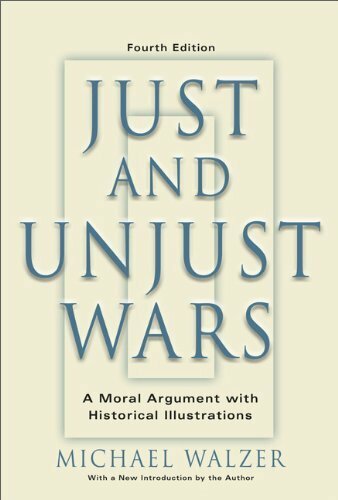 There is a long history of literature on what counts as a just war. Essentially, just war as a policy goes back to St Augustine. The early Christians were pacifists, but when the Roman Empire converted to Christianity in 312AD they needed a way of justifying war. Jus in bello – is the cause just? Jus ad bellum – is it fought justly and is it authorised by a right authority – the King or whatever? The fascinating thing in the Middle Ages was that there were two types of war – Just and Holy. A Just War was authorised by the prince or the monarch and had to be fought consistently with church rules. A Holy War was authorised by the Pope and there were no rules. So, when the crusaders sacked Jerusalem in 1099 it wasn’t, as lots of people think, because they were outside of Europe, it was because it was a Holy War. The just cause nowadays, according to Walzer, is self-defence against aggression. 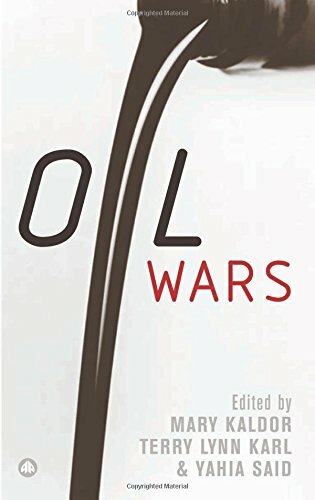 Are there other rules of war outlined in the Walzer book? Yes. There is the distinction between the non-combatant and the combatant. Non-combatants, such as prisoners of war, old men, women and children, are to be protected and there are all kinds of rules about what we now call “collateral damage” which means that the collateral damage has to be proportionate – the cause has to be worthwhile enough that it doesn’t matter if you kill a few people. What Walzer does is to outline a set of principles that have been developed over centuries. Do you think there can be causes worthwhile enough? I don’t think wars are ever legitimate, but I think there can be a justification for the use of force. For example, genocide. I think it is justifiable to use force to protect people from genocide. You wouldn’t, for example, as NATO did in Kosovo, use bombs to protect people. You would risk your life on the ground and go in to help. There is a big difference between thinking “My goal is to defeat the enemy that inflicts genocide,” and “My goal is to protect people who are victims of genocide.” I think it needs to be more like policing. The police would bring the aggressors in alive if possible, so they can be tried in a court rather than just killing them. 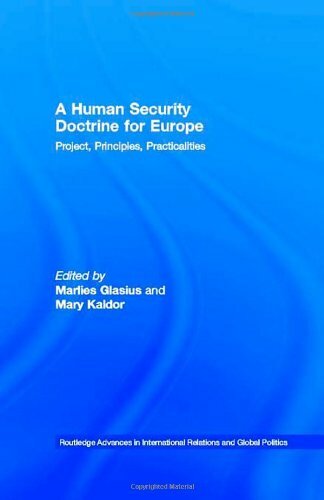 What’s interesting is that, in his second edition, Walzer recognises that self defence isn’t the only just cause, that humanitarian intervention can be a just cause too. Although it’s a secular book, the principles are the same as the principles for just war in most religions. Islam is particularly strict on this. The First Caliph said that you shouldn’t kill civilians, that you shouldn’t slaughter sheep unless you need them for food, and that you shouldn’t cut down trees. The Israelis have destroyed thousands of trees in Palestine. That’s not allowed in Islam. So the religious, Christian rules of war were codified in the late 19th century at the Hague Convention and the Geneva Convention – this was international humanitarian law written down for the first time in the Western tradition, but it is not inconsistent with other traditions. Nobody takes any notice of the Geneva Convention, though, do they? They do. It’s terribly important for soldiers whose job is basically to kill people. There is a fine line between being a hero and being a murderer. They need to feel they are obeying the law. The difference between contemporary warfare and old-fashioned warfare is that contemporary armies now shoot from a distance. The worst atrocities are usually committed by paramilitary groups because ordinary soldiers are supposed to feel they are abiding by the law. There is a link between this and Clausewitz, because by World War II the distinctions between soldiers and civilians had broken down. If you think about the Blitz, the Holocaust, Dresden, it was a fusion of the trinity, justifying total war. There was a view that it was a military necessity to go to the extremes – that Hitler was so evil that you can justify killing civilians and that even these total wars can be legitimated in “just war” terms. Let’s move on to your next book, by Rupert Smith. 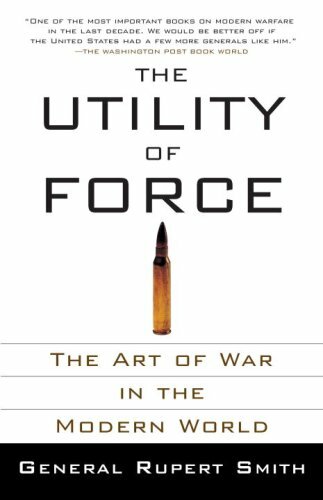 This book is really the transition from Clausewitz and Walzer to today. Smith was a commander in Bosnia and the Deputy Supreme Allied Commander Europe 1998-2001. He explains that the era of industrial war, of Clausewitzian war, is over, that war is not fought by soldiers against other soldiers any more. It’s a hugely important change. He says that war as a battle in a field with men and machinery no longer exists. There is no distinction any more between combatant and non-combatant – war is amongst the people, against the people. Clausewitzian war reached its apex in World War II. Is he talking about his experience in Bosnia? He is, but he starts with the Boer War which he sees as the first war amongst the people. He talks about Chairman Mao’s guerrilla theory which said that the guerrilla force should always avoid battle and instead try to control territory by winning the support of the people and then trying to wear down the enemy through sporadic attacks and undermining their political support. But, as a student of Clausewitz, he concluded that you have to fight conventional war in the end. Che Guevara followed a similar theory with similar results. So they behave like drug dealers fighting for territory? Yes. Contemporary warfare is just like drug dealers. The nasty guys control the territory but not by winning hearts and minds as in the theories of Mao and Che – but by spreading fear and hatred. Smith argues that there is no longer a clear distinction between war and peace. What about the Kilcullen book? He is an Australian counter-insurgency expert and a key adviser to General Petraeus, Commander of US Central Command, previously Commanding General, Multi-National Force – Iraq. Kilcullen was really the thinking behind the “surges” in Iraq and now in Afghanistan. He thinks we face a global insurgency of Takfir terrorists, basically Al-Qaida, who are trying to attack the West. They infiltrate areas like Iraq, Afghanistan, Pakistan, Indonesia, marry locals and both intimidate and bribe people in order to mobilise them to fight on their side. These are the accidental guerrillas of the book’s title. 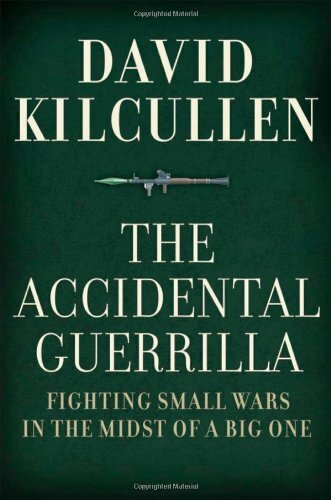 Counter-insurgency, according to Kilcullen, is about protecting people and about separating the accidental guerrillas from the real Al-Qaida people. You hear Petraeus talking about separating the reconcilables from the irreconcilables. They say they are shifting from counter-terror (killing enemies) to counter-insurgency (protecting people). It has worked really well in Iraq. There was the Petraeus injunction to “live amongst the people” – by stopping shooting they did create the space for local deals to be made. Instead of shooting from afar they set up joint security stations with the Iraqis and found that actually the Sunnis were sick of Al-Qaida and their brutality anyway and had been keen to make a deal with the Americans for some time, but the Americans hadn’t noticed. What was important was that the Americans stopped shooting from afar and started to provide basic services including law and order. It’s a huge improvement. The Americans are learning that the traditional ways of fighting and shooting don’t work. So, everything that has happened more recently in Iraq was Kilcullen’s idea? Well, Petraeus surrounded himself with a lot of bright military people, people with PhDs, and Kilcullen was just one of them, but I think this book is the best example of the kind of thing a lot of people were saying at the time. It sounds very idealistic somehow. That you just have to stop shooting and be nice. Are people really going to do this? It would be great if they did! It does involve a huge shift in the way armies think. But, for example, the war in Congo has taken four million lives and nobody knows what to do. Nobody was sent to Darfur, nobody is trained for this. What is true is that new concepts of security are beginning to be learned and applied. So, it’s very upbeat. Really, the Americans are leading the way to peace on earth? Well, everyone likes to quote Churchill who said: “The Americans always do the right thing in the end – after they’ve tried everything else.” I think they realised that what they’d been doing in Iraq was a disaster. For those of us who are on the left and against war it is awful to have to admit that America is changing things in a positive way! But they are trying this new approach in Afghanistan and I don’t know if it will work. It will be much more difficult. What’s the last book about? This is less upbeat. The Singer book is about robots. 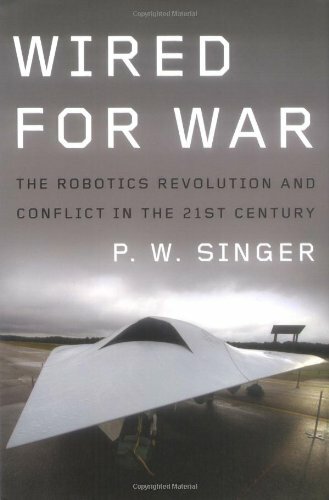 In 2004 there were 150 robots being used in Iraq. By 2008 there were 12,000. They do relatively benign things like de-mining and dismantling explosives but they also kill people. There is “The Predator” – an unmanned vehicle that hovers over an enemy for up to 90 hours before they decide whether to kill them or not. And it’s operated from Nevada. So there are these guys going into work every morning and watching enemies in northern Pakistan. And they boast that with Predator attacks they’ve killed 20 out of 40 of Al-Qaida’s leaders. They say it’s the West’s answer to suicide bombers. But that’s good, isn’t it? No, I don’t think it is. They often kill civilians, but in any case it makes people furious. They say the West is cowardly. It enrages people. You could hover there and send the police in to make an arrest instead. Killing them remotely like this alienates everyone and it’s horrendous, I think. Worse than going in and shooting them? Yes, I think so. War is supposed to be a struggle between human beings. If you risk your own life to do it and you don’t have the impunity of doing it from Nevada, you can think more carefully before you act. There’s this little thing Boeing has developed that you throw into the air and you can see what’s happening over the wall or over the hill. You use an XBox to control it, so these boys grow up playing computer games and they carry on playing them. It’s alarming if you think about the future of war. But you have your own theories about war? I do agree with Smith that there has been a fundamental change in the nature of warfare. I don’t know if you can even call it war any more. The warring parties, who are usually not armies but a mixture of regular and irregular groups, avoid battle and control people by killing or displacing them, and by committing atrocities. Though they often claim to be doing this for some cause, it is very often linked to crime. For the Afghans it’s drug crime, in Bosnia it was looting and pillaging. It’s a way of making money. They say the crime is funding the violence, but often political violence provides a cover for crime. What you see is a mixture of war, human rights violations and crime. Perhaps you’d only call it war if it’s violence about political causes. I think war is an anachronism. It’s in huge decline. There was a bit of a hike in the early 1990s but since then the UN has been starting to learn how to manage conflicts. Where once there were regular armed forces and the Clausewitzian model with the justification of St Augustine, there are now wars funded by crime, not by taxes. Battles are rare and the main victims are civilians. So I think that we in the West need to completely change the way we do security – it needs to involve a mixture of police, the military, development experts, people who can establish a rule of law and a normal functioning society. I call this “human security”. In this new kind of war, in which civilians are the main victims, we need to establish a rule of law. What I mean by a rule of law is a society where people relate to each other non-violently. 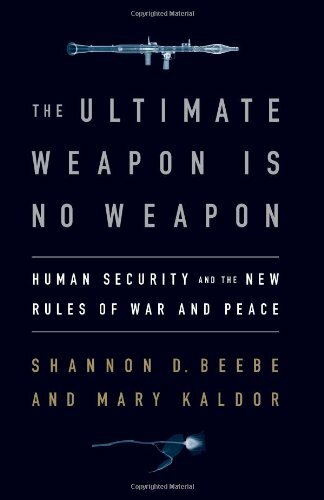 This is how my approach, a human security approach, could help to end wars.